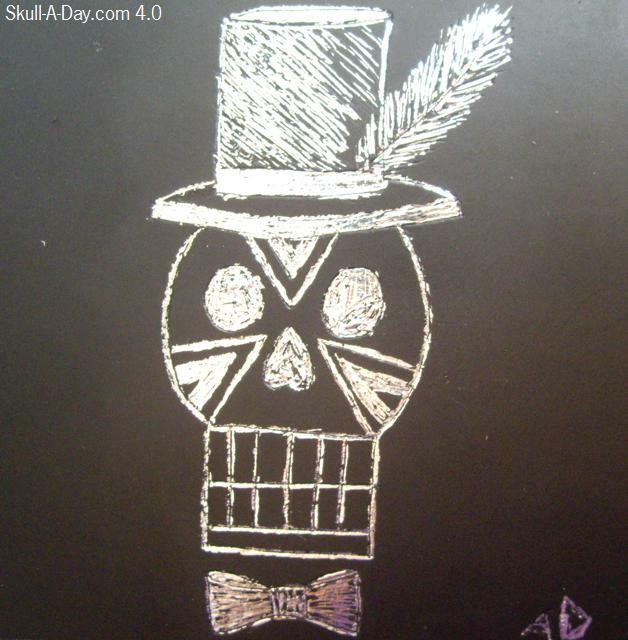 Wenchkin is an artist after our own hearts here at Skull-A-Day. 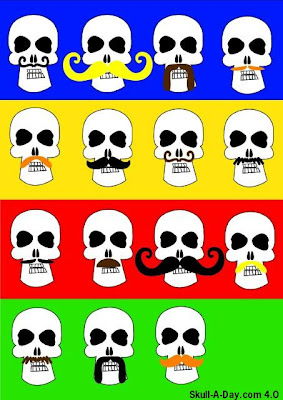 Today's skulls are portraits of her friends from a project titled "Bone Buddies". She writes, "I am an artist whose main subject is skulls, so much to the extent I did a project where I took 200 of my friends photos and turned them into skulls". 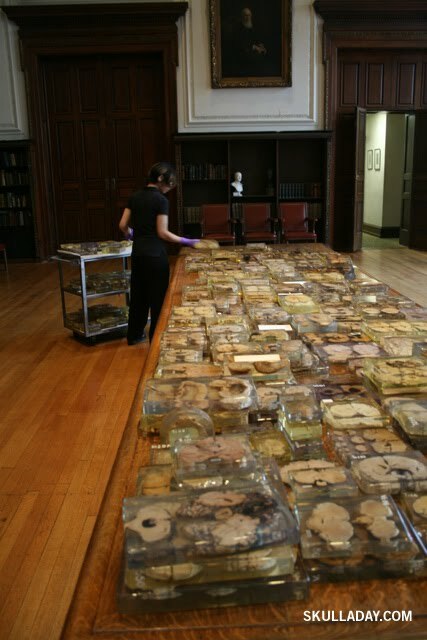 In all there are 200 different portraits, but here's a video of the first 50 or so. What an amazing project you created, wenchkin! Friendship is a wonderful inspiration and I'm sure your friends were thrilled to be a part of it. While watching the video I felt myself recreating the original picture in my head. Thanks for introducing your "Bone Buddies" to all of our friends. Today we get into my favorite top ten. This is a piece that I felt never got the full recognition it deserved. Seeing this piece always reminds me of how when I was a child I was told how important it was to cut these up before we threw them away. 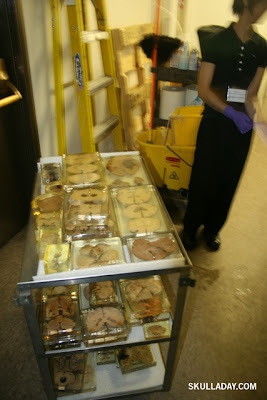 I remembering being told about the animals that would get caught in them and die if we didn’t do it. This piece serves as a fitting commentary on that idea. This is another piece that falls into that wonderful category of what I see as readymades. The object remains the same, just changed in its appearance. The ability to do this is something that was repeated in much of the original 365.25 and it is something that I continue to admire in Noah’s work. 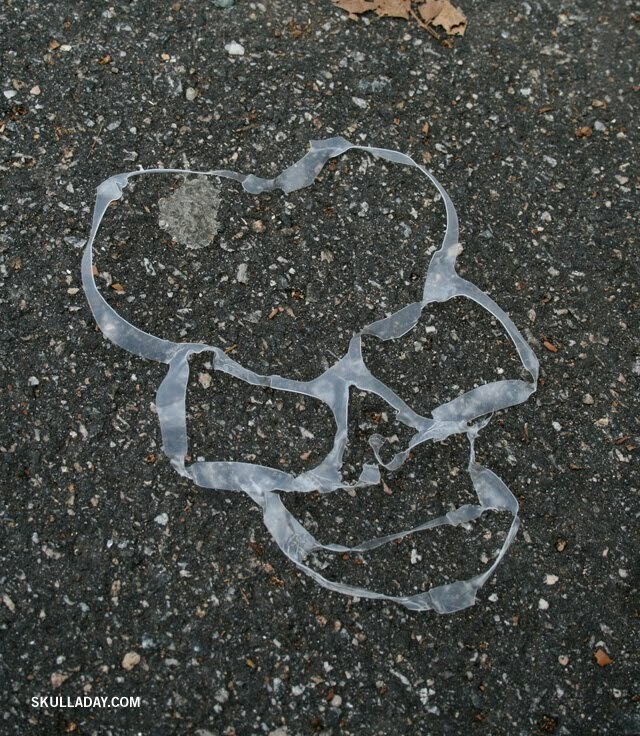 On a side note speaking of trash in the ocean, I just want to share this fascinating story that I think about often. 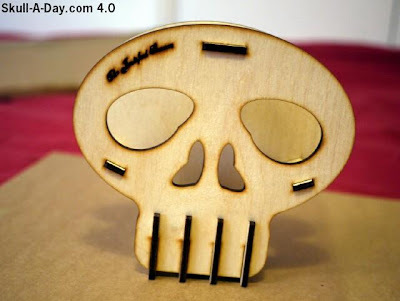 ♫ A skull with laser cut eyes ♫ Thank you for submitting this piece for us to share. I enjoyed seeing the process of you putting this together after it arrived. What I find most brilliant about this design is the fact that you incorporated the utilitarian feature of it hidden from the artistic side if of it. When it is in use one can still see the skull you designed perfectly. Best of luck with this experiment and if you decide to go into production with these please let us know. I try to always carry a hand fan with me where ever I go. The temperature in and out of buildings is alway fluctuating here, so I want to make sure I stay comfortable if it's too hot. The ones I like to carry are normally elaborate, but small enough to fit into a purse. 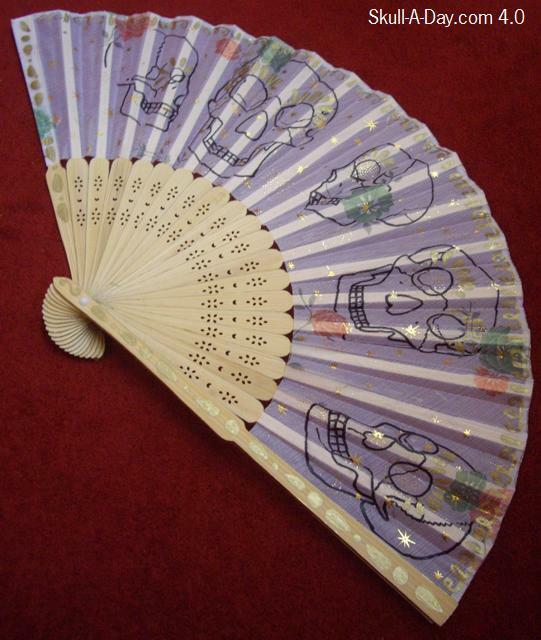 I knew when I saw this inexpensive fan, that it needed to be adorned with skulls. Fans have been used for many centuries to keep people cool. From huge palm frawns of ancient times to metal monstrosities of this age. Some of my favorite hand fans are the huge feather ones used by dancers, the intricate hand painted Japanese fans, and the overly ornate ones of early European favor. They are practical, yet glamorous. If you would like to know how I embellished this inexpensive fan, see the tutorial. Every week in the 4.0 year, I will be post my own Dia de la Abby posts as well as a tutorial with instructions on how I made my piece. Hopefully you feel inspired by my posts just as I was by Noah's Skull-A-Day 1.0 daily project. 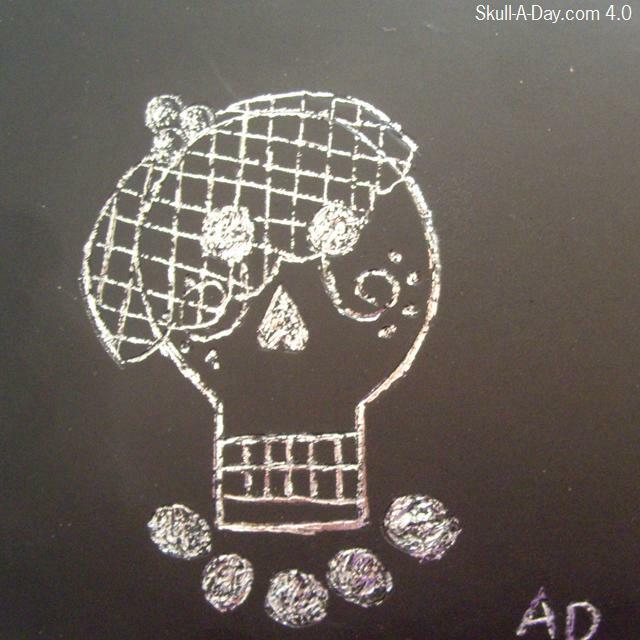 Return submitter, Edward Przydzial sent us this great photo of him as a skull. Edward does great work. I'm really impressed with this skull make-up. I love the gaunt look the texture gives to the skull face. The rest of the costume combined with the skull reminds me of Jack Sparrow from Pirates of the Caribbean. 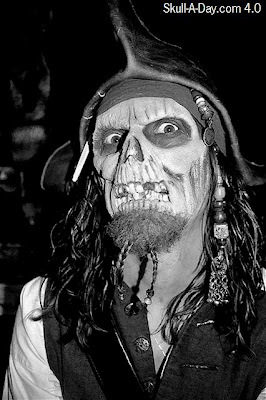 Pirates are people who you don't want to run into, and a skull one increases the scare factor. 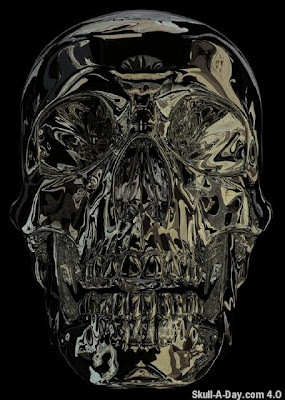 I've been looking at different skull make-up designs for an upcoming party, this is the 1st really masculine one that I've seen and I'm thrilled. 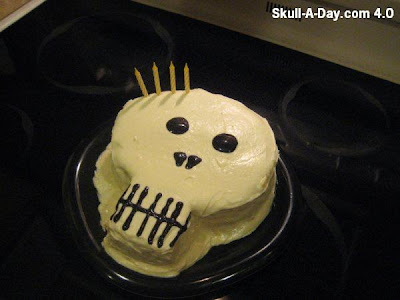 I'll have to do something similar for my husband, when his need to be a skull arises. If any of you have made yourself into a skull or skeleton, please submit your photos to us. We would love to see them. 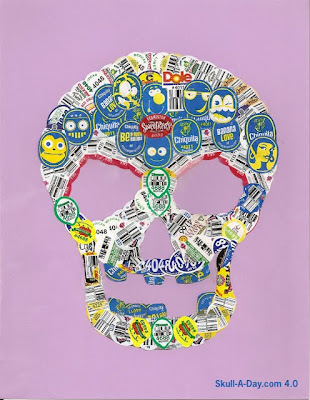 I'm behind on my blog reading and only just discovered that Ryan August, creator of the fantastic I Want Your Skull blog and a kind supporter of Skull-A-Day early on, died a few weeks ago in a car accident. He is survived by his wife and son. There is a Facebook page that has been set up to allow friends to post remembrances about Ryan HERE. If you found creative inspiration in his blog & art please consider helping his family out by making a donation, several options for helping out are also listed on the Facebook page. Thank your friend for us for sending you our way. You have a great start here on making your very own font. I enjoy the subtle changes that you specifically made with these two pieces using the shape of each skull to accent the character above it. Thank you for submitting your work for us to share. For more inspiration, you should check out the fronts from the original 365.25 that are availible at the “Free Stuff” link at the top. We had our end of the year awards ceremony, and to commemorate the new troop crests, we decided to hold it in the local Victorian cemetery. As part of the ceremony, each girl listed a few things on her personal bucket list! We hiked back to my house and enjoyed snacks and Brianna Ariel's Whimzkulls cookies. 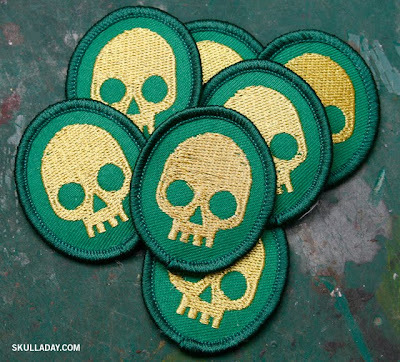 Thanks so much to the guys at Nerd Merit Badges and of course Skull-A-Day for giving Troop 202 a crest that truly matches the group personality! 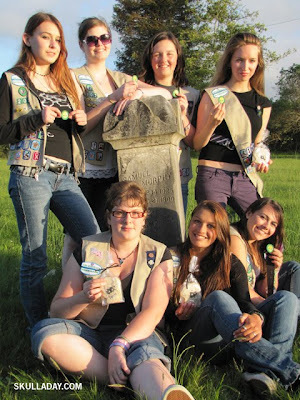 What can I say, I am just honored that my work will be gracing the sashes of clearly the coolest Girl Scout troop around! P.S. I actually ended up with a small amount of these patches myself, and I would like to give them away, but like the Girl Scouts you have to earn them. 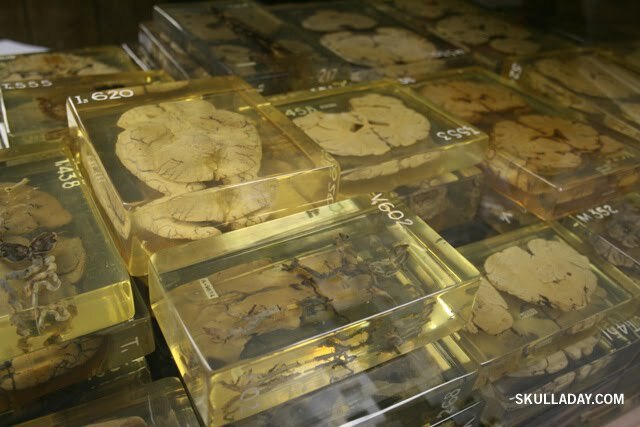 So here's the deal, the first five people to get June 4, 2011 officially recognized as "Skull Appreciation Day" in your city, state, or country (and send in proof), will get one! Today's skull is one for the lot of you who like to knit one, purl two. Michelle Rautis showed some real thoughtfulness with her knitted skull cloth. She writes, "I recently had a friend who was going into the hospital to have hip replacement surgery. 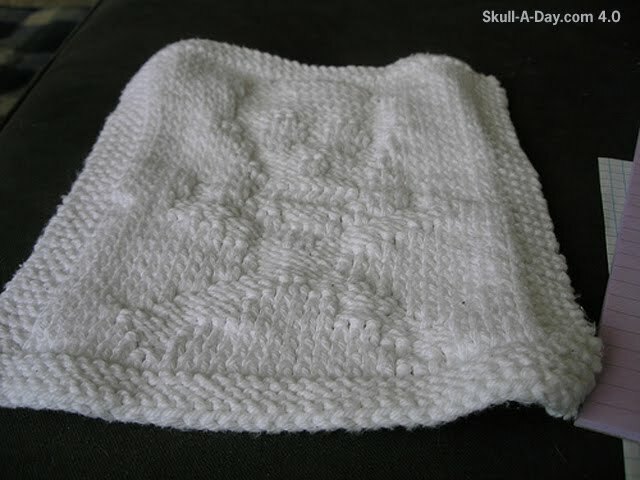 I wanted to make him something he could use in the hospital and being that he is younger and likes skulls I designed and wrote the pattern for this dish/wash cloth." This is very cool, Michelle. I know nothing about knitting, but I do know a thing or two about handmade skulls. I'm sure your friend will be happy to put his skull cloth to work washing whatever is...ahem...necessary. Thanks for spreading your friendship through skulls. UPDATE: Michelle has informed me that she will be sharing this pattern on her blog very soon. Check it out here to keep watch for it. It's been said by many that breakfast is the most important meal of the day. Whether you enjoy a healthy piece of fruit or a piping hot plate of biscuits and gravy we all know that breakfast is what can get us going for the day. Now you can combine your love of breakfast with your love of skulls by winning an Eggs & Bacon Skull t-shirt from Zooky shirts. 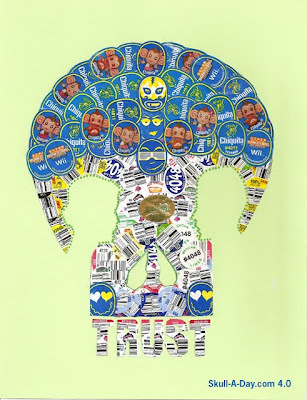 Dave Williams was inspired by Noah and Skull-A-Day to create his own blog for "Zooky" projects over at Zooky World. 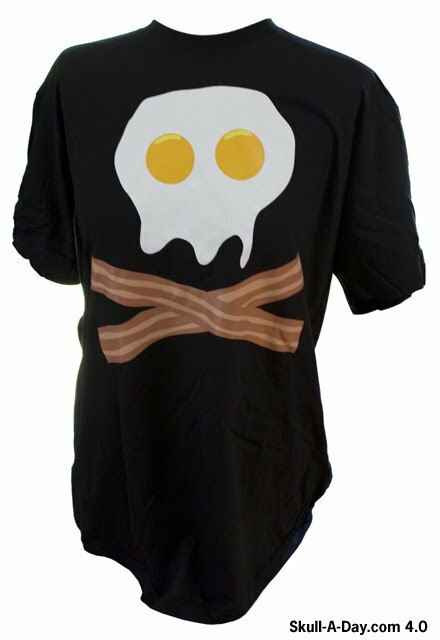 He has graciously volunteered to give away one of his Eggs & Bacon Skull shirts to one of our lucky readers. You have until just Midnight Eastern Time August 2nd to enter so don't delay! The contest is over! Thanks to everyone for participating! And of course you don't have to wait til the end of the contest to get your own Zooky shirt! There's tons of different designs to choose from. 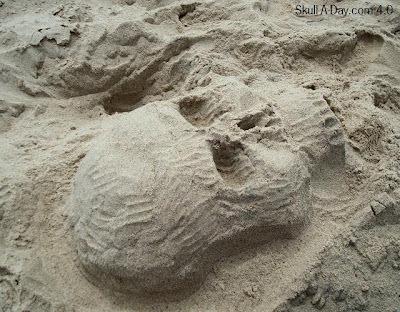 Andy Hamm and made this skull with the help of his wife, Carol Ann Livingstone, on Martha's Vineyard, South Beach. I was recently at the beach, so I still have sand on the brain...and in my car. I've always enjoyed seeing wonderful sand sculptures like this one. It takes a lot of creativity, time and patience to make such a wonderful piece. Of course it's lots of fun too taking something as common as sand and molding it into a sculptural form. This particular piece reminds me of the two sand sculptures ( Sand Skull 1 and Sand Skull 2 ) that the skull master, Noah, made during his 365 project. Odd thing about this photo, If you rotate it 180 degrees, the skull appears inverted. It's an optical illusion that I suggest you try. 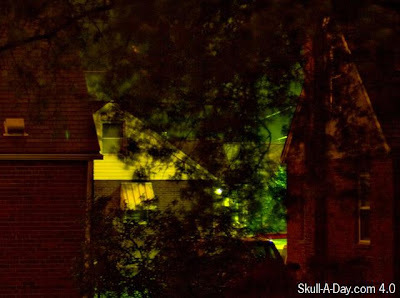 Nicholas Joseph Viltrakis sent us this shadow skull. You should be able to see it if you look at the light colored house. I also think the right side house's windows, chimney and bush look like a skull. So, it's a 2 for 1. 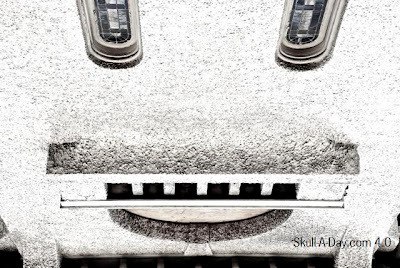 Mr. Wishnack, "found this semi-skull on the side of an old abandoned church on Nob Hill in San Francisco. This skull find is sort of robotic to me. Reminds me of the retro robots of sci-fi films and toys. 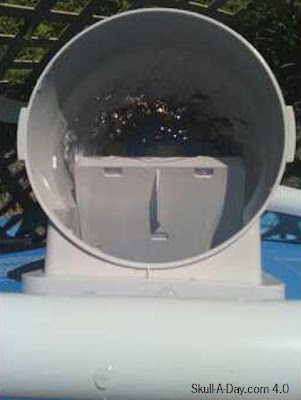 Callie Haplea found this "SkullaPOOLooza" skull while "looking down into the pool filter". This one reminds me of "modern" paintings. Also, anything involving a pool in the summer is a great thing. 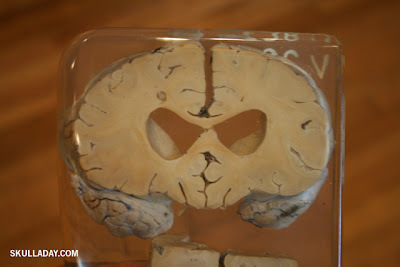 Keep sending those found skull photos in to our submissions address. We are running low, so start searching and submitting! Just keep in mind that since we only post simulacra once a week it might take a little longer than normal for it to be posted. It's more skull shoes for a "sole-full" Saturday. Kayla recently did a painting project and used Noah's #9 stencil skull. Good work on the shoes, Kayla. 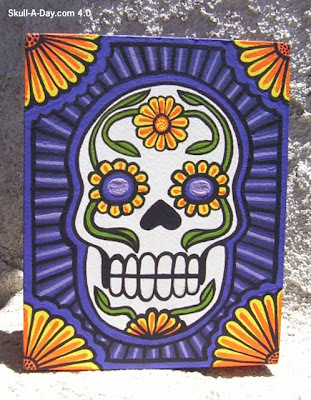 The bright coloring camouflages the skulls for a great subtle effect. 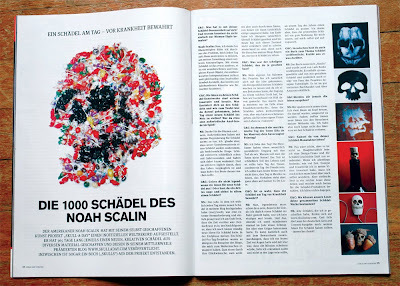 You can find more of Noah's stencil and other goodies under the Free Stuff link at the top of the page. If you are inspired to use any of them then be sure to send us a pic so we can share it with our readers. Skull-A-Day friend Miykey is back with another pair of fantastic looking painted shoes. In case you missed his other submissions you can see them here. Once again you present a job well done. I can't imagine feeling depressed or in a bad mood if I were walking down the street in a pair of these. Way to keep in stride with awesomeness, Miykey! You can see more of his work here. Looks like today I am carrying some more baggage from last year. 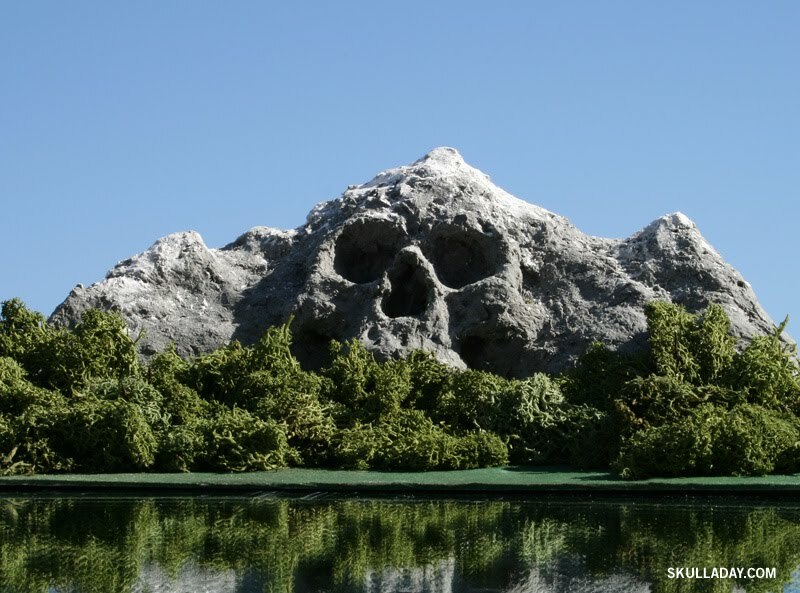 When I first saw this piece, I was fooled into thinking that this was a photoshop job of a real mountain. After enlarging the picture I then realized what an extraordinary piece this was. 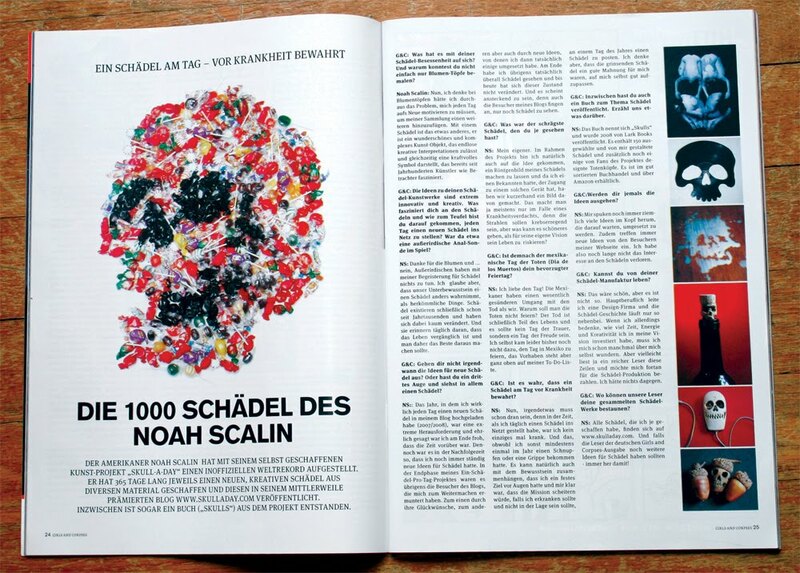 If I remember correctly each skull Noah did back in 1.0 was actually started and completed in the same day. The Skullmaster must have rose with the sun in order to finish this while there was still daylight to take the picture. To this day I am still curious about the size of the piece, I know the dimensions, but I just can't imagine what it would look like say next to a gallon of milk. To this day, I still really enjoy the mirror effect for the water, how can something so smooth cause such a ripple effect. In thinking about this piece today I was reminded of the early 20th century climber, George Mallory, who’s body was recover 75 years later on Mount Everest. This piece would make a fitting tribute to all those who push the limits of their human existence for eternal recognition. Jennifer Ferrell from Tennessee wrote: “My son Parker loves skeletons. 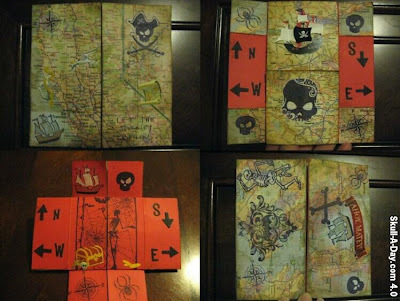 This is a birthday cake I made him and a Never Ending Birthday Card, it's his secret treasure map. Although he will deny it for a time in many years from now, your son is very lucky to have a mom like you. A hand done cake and a fancy treasure map really made this occasion something to remember. I really like that you upcycle items not just in this piece, but in that other work that you create. Thank you for taking the time to share your work with us, and please also note that around here that most of us are a part of a rouge band of Space Pirates which you are also welcome to join here. 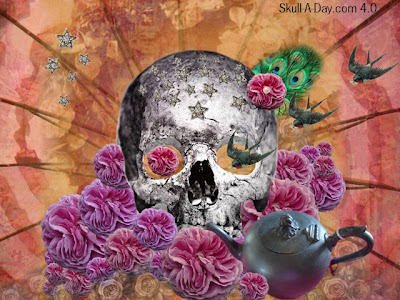 ** Now on to a Skull-A-Day celebration, this is the 2,000th post to the site. Make sure you Flashback to the one that started it all here. Thanks to all who helped us get to this milestone, and assisting us in the future towards the next one. A few months ago, we were invited to the formal wedding of two of our close friends. John and I had outfits, but our daughter, Alex, did not have a fancy dress to wear...well, one that still fit. She is growing so fast, her old ones don't fit any more. 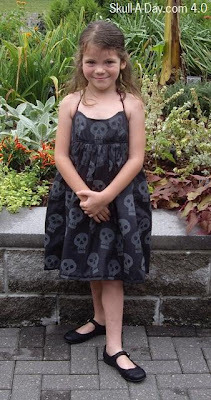 I asked her what kind of dress she wanted me to make her, she told me she wanted a skull dress. So, I made her one. She wore the dress this past weekend. There are lots of commercial skull fabrics available, but since I wanted to use this creation for a Skull-A-Day post, I decided on making my own skull print fabric. I made a foam stamp, for which I made a tutorial, so you can make your own foam stamps and print fabric using them. 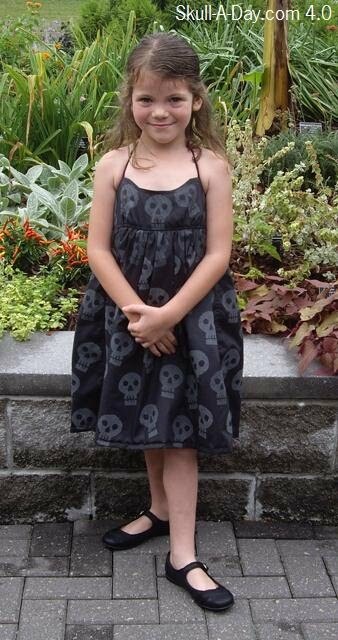 I think I will make a skull cherries stamp next for my own dress. Alex's dress is not your average wedding attire, but it was well received by all. Ryall Burden send is this water color, pen and ink that he did while "filling in time one day". I love the nicely blended water colors under the roughly sketched skull. The configuration of the water colors remind me of what the setting sun looks like on clouds. Combined with the skull in this sun drenched clouds, makes me think this skull is rising to Heaven (should you believe in Heaven)...which is an appropriate place for skulls to go. It could also be a good way to honor all those pilots and passengers of the past who did not land safely. Since we are not naturally flying creatures, taking a plane to fly is a risk. We can only hope that when we chose that travel method, that we land safely and can go about enjoying our lives as if they are our last days. Life is too short not to. 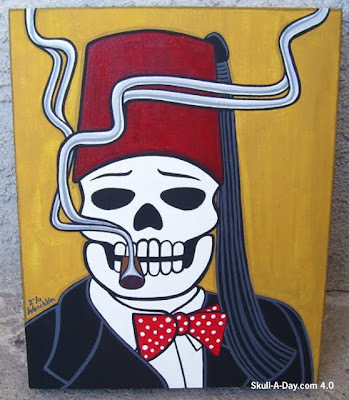 Scott Smith of Rucus Studio in Portage, MI wrote: “This skeleton/skull is a piece I created for one of my online shows. 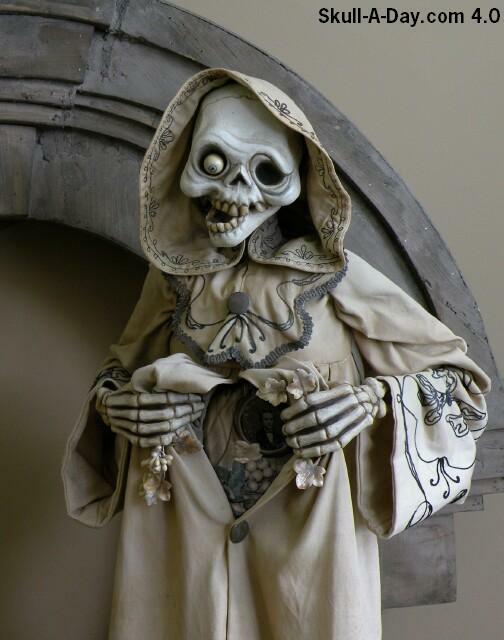 The piece is titled ‘Memento Mori’ and is made of papier-mache, composition and antique fabrics.” Scott also told us his work can also be viewed in person each year at the Ghoultide Gathering Art Show near Detroit, MI. More information about that show can be found here. One of the things that I look forward to in my duties is being exposed to all the great living artists currently working in the field. Thank you for sharing this work and your art with us, and also thank you for sharing the information about the annual show you participate in. You have made many people’s bucket list one line longer today. More details about this project soon! This ginormous skeleton mural comes to us from a trio of friends calling themselves "the oks". J-e sent us the pic telling us, "We just completed this 55m x 4m(180 ft. x 13ft.) skeleton. There's one of us standing in front of the skull in order to give a size comparison. We did this in two days." Not only am I impressed by the sheer size of this piece, I am amazed that it was completed in two days. The bright colors do a great job of contrasting the lifeless black and white. The gold tooth lets us know that whoever this skeleton belonged to, they were the life of the party. 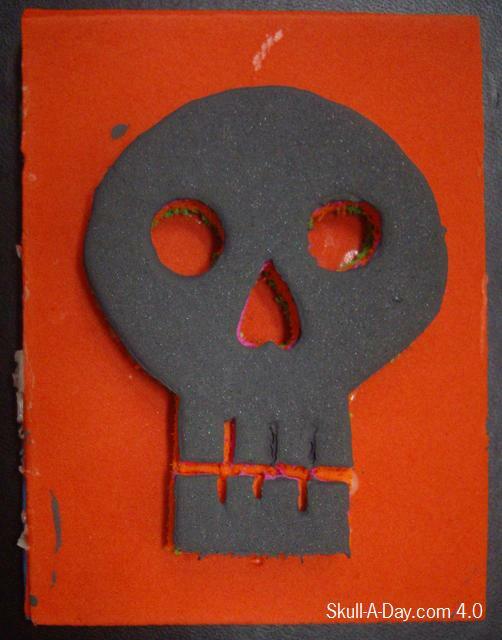 Kim Schulze from Shreveport, Louisiana send us this handmade paper and paper shreds skull. People have been making paper from thousands of years. Now, it's readily available and something so common that we take having it for granted. There is something nice about being able to break down something common to make it your own. 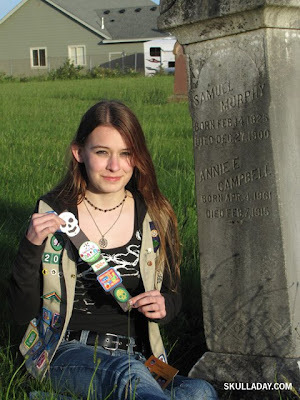 I've only made my own paper once, with the Girl Scout troop I was in. I remember loving the gooey feeling of the paper pulp made from ground up bits of paper and seeing the end result of my hand made paper. My mom probably still has it. For this skull, I like seeing the texture of the pressed pulp and paper shreds. The shreds give the effect of hair. 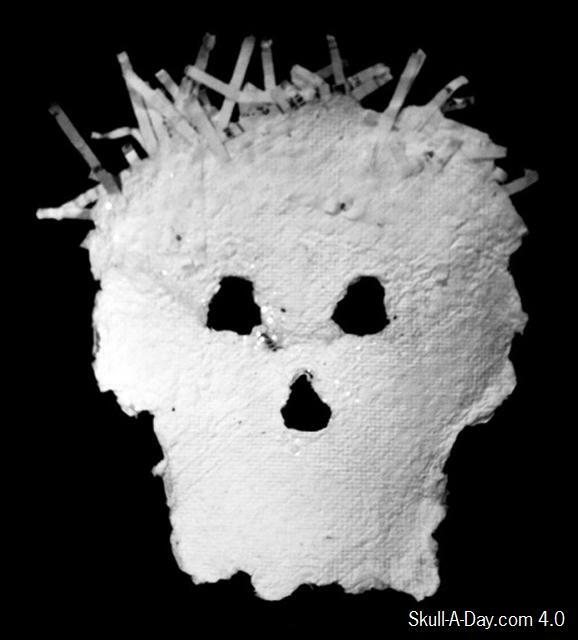 I know it takes a lot of time and patience to make paper, so I commend you on making a shaped skull with the shredded paper hair. It's Sunday again and our avid skull hunters are still on the prowl and catching us some great simulacrum. Enrique Camacho did a stellar job snagging this pic. 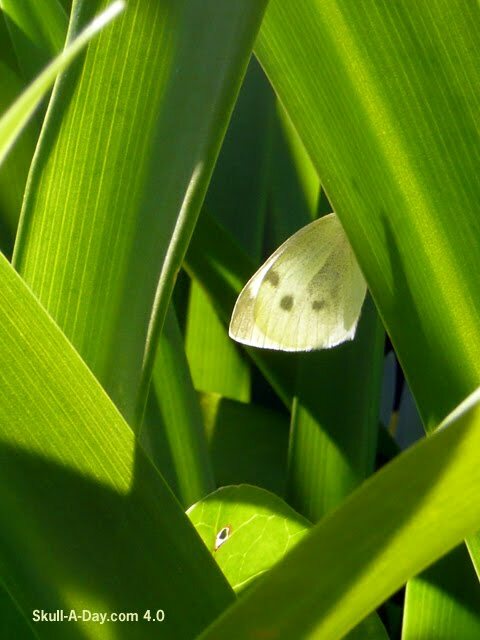 "Attached is an interesting picture of a butterfly/moth(?) I took while visiting the community garden in the Potrero Hill neighborhood of San Francisco, CA." Daniel made his discovery during a family moment. "My little sister was playing with some water, making designs on her shirt. 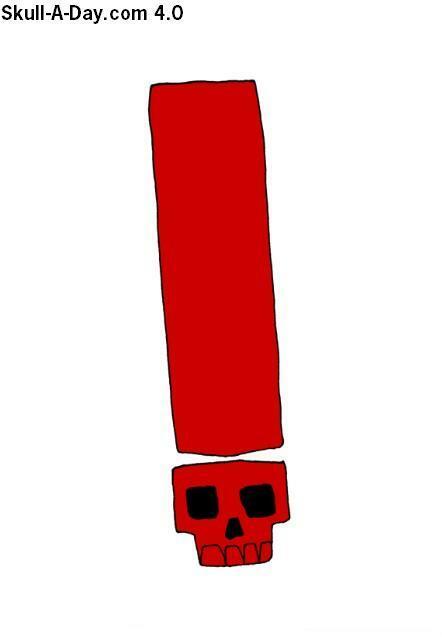 As soon as she showed me this one, I noticed how it resembled a skull. Skull-A-Day instantly popped into my mind." Wendy Ott captured this pic of a wooden skull. 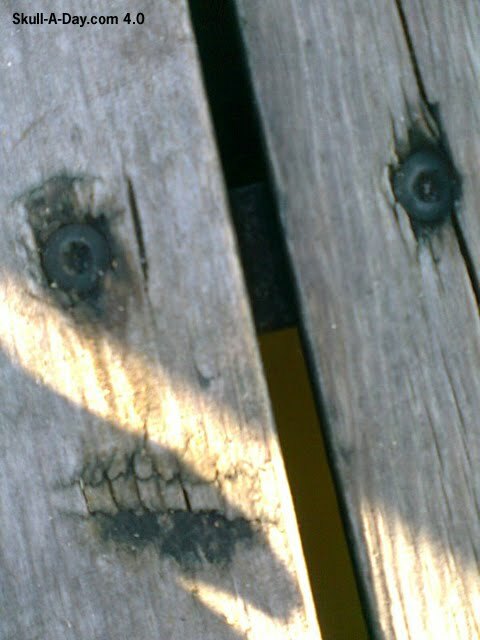 "I took this on a dock. Cool huh?" It looks like the skull hunters have returned from another successful hunt. Don't forget to look for those hidden skulls all around us and submit them. Be sure to get them....before they GET YOU! If you like fruits and veggies as much as the Skull Master then you will surely recognize today's skulls. 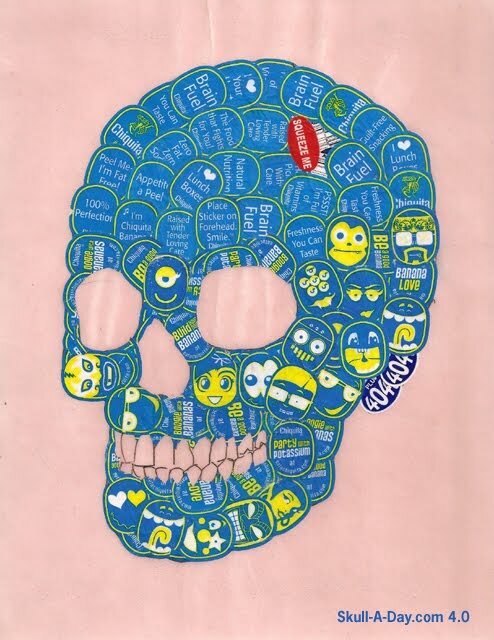 Ainslee Lara sends us some of her sticker skulls that not only look sweet but might actually be good for you too. *This skull is taken from the Wilco logo with the word "Trust" replacing "Wilco"
It still amazes me when I see our readers making such awesome skulls out of such ordinary items. We've all seen these before, but Ainslee has put a whole new spin on how I'll look at them from now on. If we keep getting these great skulls in "bunches" then we'll have to "stick" around for a long time to keep sharing them. Thanks, Ainslee! I am a one trick pony when it comes to comments on this one, I wrote almost the exact same comment today as I did almost 3 years ago and now I have that song stuck in my head. 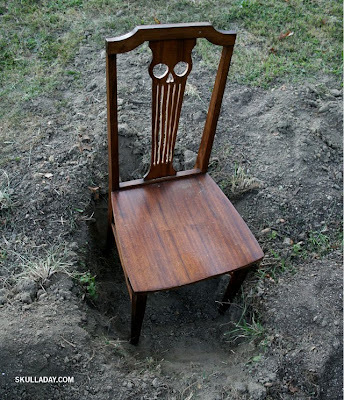 When I saw this piece, sitting where the photo was taken, I immediately thought of a tombstone. I even went so far as to send in a roughly edited photo of it that was featured here. 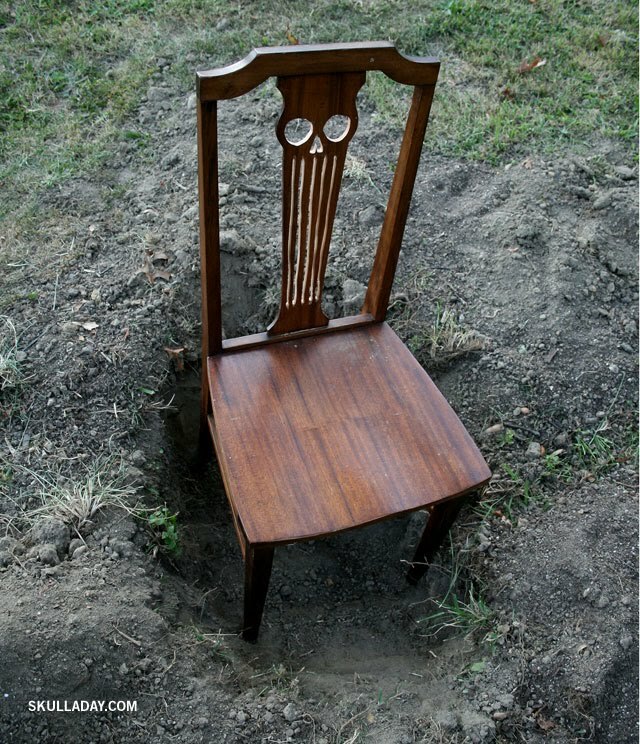 I don't know what type of chairs your parents have, but the shape of this one accents the skull design so perfectly. Another reason why this one has stood out in my mind for so long is because of your conversion of a functioning everyday object into art that is probably still functioning in its original purpose. Once again I am reminded of the mid-20th Century art movements in which lines were tested taking art off the gallery walls and finding it in everyday usable objects. You need to thank your professor for us for inspiring you to submit your work, and now that you have found us please pass some encouragement on to someone else you know. 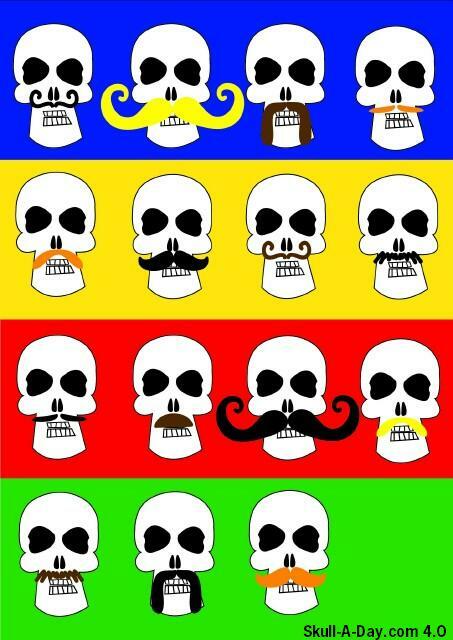 Your use of colors and the great exaggeration of some of the mustaches remind me of images from Day of the Dead artwork. 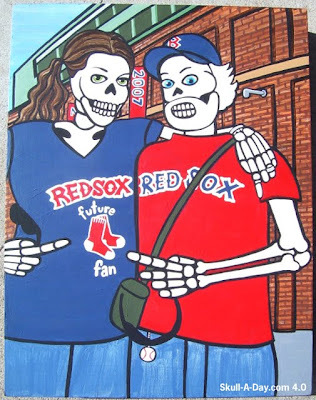 I truly like the whimsical nature in which you tackled a subject matter like a skull. Sometimes we may get some rather dark imagery so a piece like yours in very refreshing. Thank you for submitting your work, we look forward to seeing more from you in the future as you pursue your studies. This was inspired by the two goth weddings I will attend this summer. Silver for weddings is traditional for a 25th anniversary, but for this, I'm honoring new marriages, with hopes that they will be successful long past 25 years. 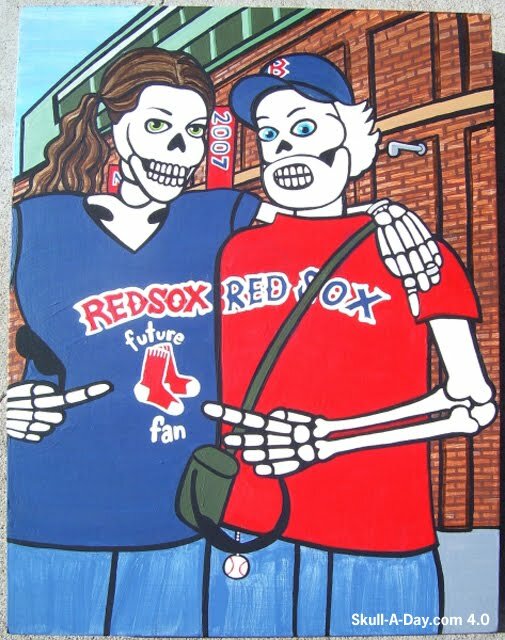 Skulls are a perfect fit for weddings, since traditional marriage vows include "til death do us part"...though of course that isn't true of all marriages. Regardless of the length of any relationship, life is short and you should enjoy each day like it's your last. I found this etching/scratch art paper and knew it was perfect for a skull. It's been a long time since I've used this paper and it was still finicky to work with, but I like the rough silver outcome. The tool has a pointed end with round edges, but it depends on the angle you use it as to how well it will scratch. Scratch too much and you will tear the paper. Even though it's finicky, I do suggest giving it a try. I don't have a tutorial for this technique, but I did find this video of a Scratch Art show, that does show artists using scratch art to make amazing pieces. There are a few skull pieces in the gallery. Sandra Kane from Brisbane, Australia, sent us this digital print entitled, "Meurte's Tea Party". Here is her inspiration description for this piece, "This vibrant artwork is inspired by the holiday “El Día de los Muertos”. This colourful holiday includes both mourning and rejoicing, woven together into one emotional fabric. Death is as much a part of life, as life itself is. It is likened to welcoming home a dear friend." To see or buy Sandra's other pieces, see her Website, Etsy and Facebook. I love a good tea party. A Dia de los Muertos one would surely be fun and festive. 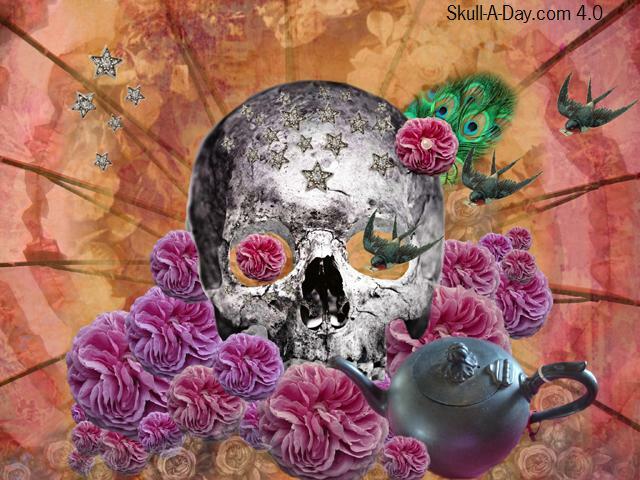 I like how to the skull is surrounded with flowers and birds, which represent life. The sparkley stars and fascinator (the flower with the feather) make me think this is a glamorous party for a glamorous deceased lady. If you were to throw a party for a skull, what kind would you have? ** For non-French speakers, the page is translated into English here. This is truly an amazing collection of work you did. I was moved by your blending of the modern digital art techniques with the old styles as if you are commenting on how art styles are only as alive for the time in which they happen. I also admire the art work you choose to work with. 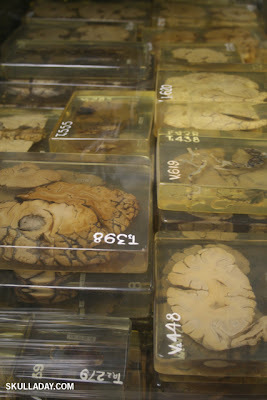 One can not turn away from the message that these works have when you link them to the imagery of a skull. Thank you for submitting your work for us to share. 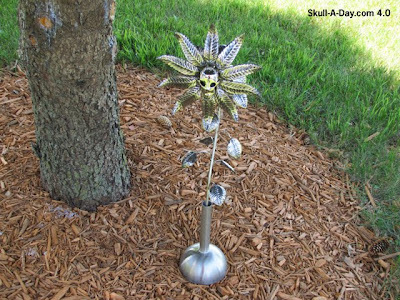 Long time Skull-A-Day friend, Larry Pearson, is trying to brighten our readers' day with this totally rad "Skulldaisy". I'll let Larry explain how he made it..."I had a few minutes waiting for a quote on a steel order the other day and decided to try a few parts on my skull idea. Well, I kinda liked how it was going, so I decided to keep going till it was finished. It is made from 1/16 & 1/8 inch stainless steel sheet scraps for the skull and flower, I used 1/8 inch welding fill rod for the teeth. The skull is 3" long, that's as small as I can get with my tools. Over all height 28", width 9"." As usual I am super impressed with your metal works, Larry. I love the way it shines and the way it brightens your day in a skully kind of way. The details you put into the skull and the petals shows that you really love your work. 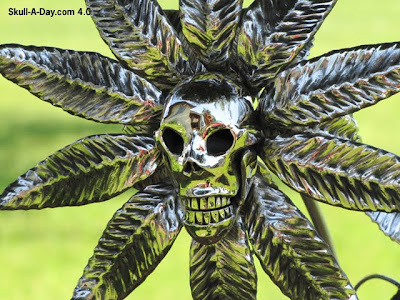 If you want to see more pics of Larry's work in progress then check here or visit his site here for all of his great metal works(which includes some great skulls). Thanks, Larry!